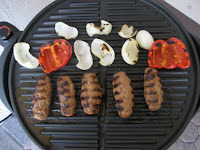 TheArmenianKitchen.com : Hamburger or lamb burger? No contest! Sometimes, the most satisfying meals just sort of happen. I was in the supermarket the other day, heading for the two-for-one chicken breasts, when I spotted something truly unexpected: ground American lamb. Columbus couldn't have been half as excited when he finally spotted land. I snatched up the only two packages left and sped down the aisle to catch up to Robyn. When she saw the lamb, she said exactly what I was thinking: "Lule kebab!" Like many Armenian favorites, this recipe has many variations and numerous cousins in other Near and Middle Eastern cuisines. The common ingredient is lamb and the common shape is more or less sausage-like, without the casing. Of course, you can make lule kebab with beef, but I actually prefer lean ground turkey if lamb isn't available. Turkey seasons nicely and you can overcome the dryness with a little olive oil. To me, ground beef just tastes too much like hamburger no matter how well it's seasoned -- and who'd settle for a hamburger if your mouth is all ready for a lamb burger? What's so great about ground lamb? It's wonderfully tender, even when well done, and it holds its shape beautifully. Plus, it tastes right. Yes, it's usually fattier than ground beef, but only because leaner cuts aren't often ground up. That's easy to overcome in the cooking -- always in a grill with drainage. As for those variations, some add finely chopped onions and red or green peppers to the meat, but I prefer mine grilled on the side. Others add bulgur or even bread crumbs, although I don't see the point. In fact, the list of seasonings and other mixings is endless. My choice is to keep the lule kebab simple and let the lamb taste like lamb, with a distinctly Armenian accent of course. Want more flavor? Serve with chopped onions and parsley. Best of all, make a kebab sandwich out of rolled lavash or pita bread and tuck the parsley and onions inside. Fantastic! And while some insist the kebabs should be formed around a skewer, it's not necessary. Just remember to keep turning them evenly. This makes five or six kebabs, enough for two people. Just mix it all up with salt and pepper to your preference and shape the kebabs like sausages -- you don't have to get fancy or worry about making them perfect, but try to keep the thickness about the same so they cook evenly. To check the seasonings, make a mini-kebab and cook it in a frying pan. Cook until done -- which, to us, means well done. Tip: Toss some tomatoes, peppers and onions on the grill for even more flavor. Serve with a salad and the pilaf of your choice. I, too, stumbled upon fresh ground American lamb at my local store and I, too, thought Lule Kebab! Except I didn't remember the Armenian words for it, so I guess I thought: "Doug and Robyn's Armenian lamb meatballs!" Anyway, I used your recipe except I added finely chopped garlic (OK, I add it to everything) and onion, bread crumbs, a half teaspoon dried mint, an egg and I left out the tomoto paste. (Does that still count as your reciope?) But, oh, was it delicious. I think the key thing is the addition of coriander and allspice. That's right! The key ingredients are definitely the spices. Lamb MUST be seasoned with coriander in our house. I put ketchup in my lulu kebab and cumin. My husband even likes it. I was hoping to track down the recipe for 'Armenian Hamburgers' as served at Joseph's Cafe in Los Angeles (at least before it became a chi-chi, Paris-Hilton-ridden 'nightspot' a few years back), but I am SO much happier to have found this THIS site! Great recipes, great 'voice' in the writing...and this even feels like the right recipe - in my mind's palate, anyway. Thanks! I agree with you, why on the earth Armenians try to "own" everything. Okay if disputed, call it Caucasian Kitchen. Armenians no how to cook all lamb dishes that you can't even pronounce.